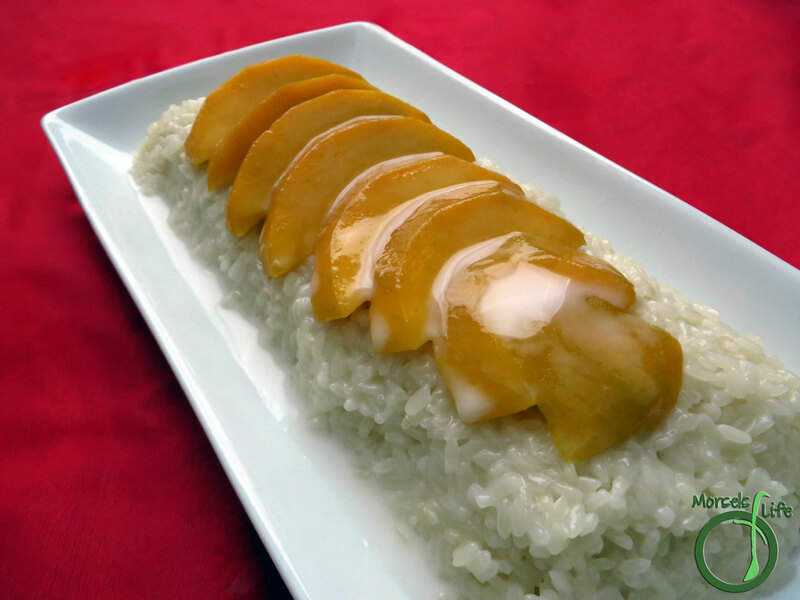 Mango sticky rice is made from sticky, or glutinous rice. It's actually a different type of rice, and not just rice made sticky with more water. 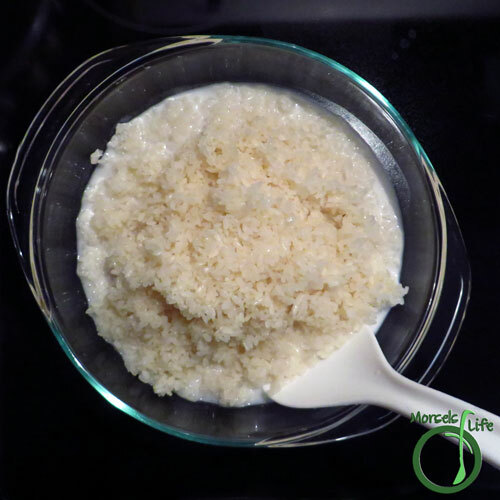 This short grained rice naturally sticks more when cooked. Thus, it's called glutinous rice for its sticky characteristics and not its gluten content. 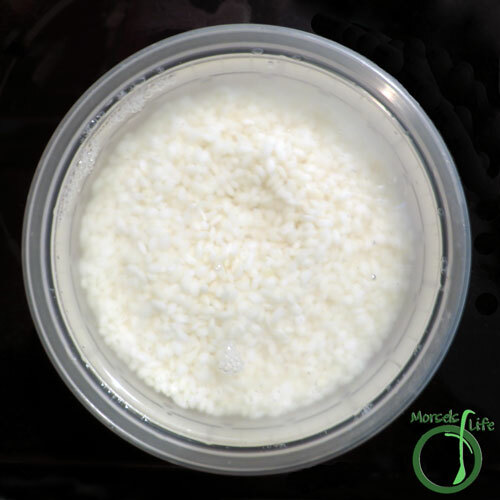 In fact, glutinous rice doesn't contain any gluten at all! 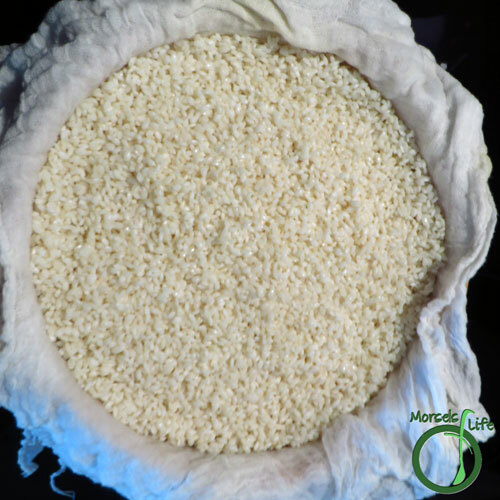 The stickiness of this rice is due to the higher amounts of amylopectin and little or no amylose. The amylopectin causes the rice to be more sticky and is due to a single mutation farmers selected for. In Thailand, this rice is a staple grain. Now that you've learned a little bit about glutinous rice, I'm going to go into how sweet coconut sticky rice is made. 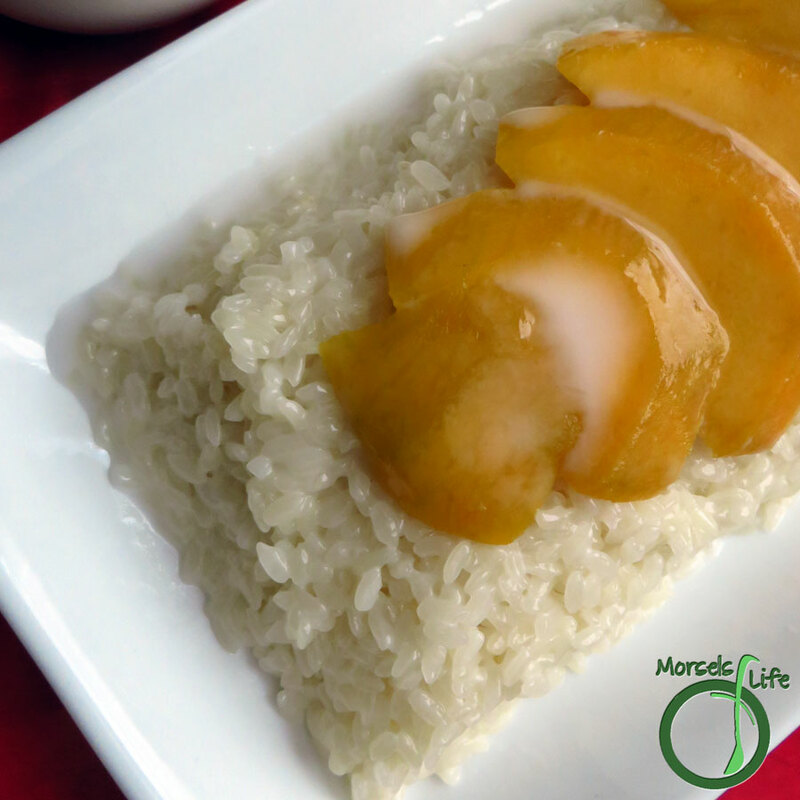 This coconut sticky rice is commonly used as a base for the mango sticky rice dessert. Making this rice is very simple and straightforward. Simply soak or wet the rice, and then steam it. 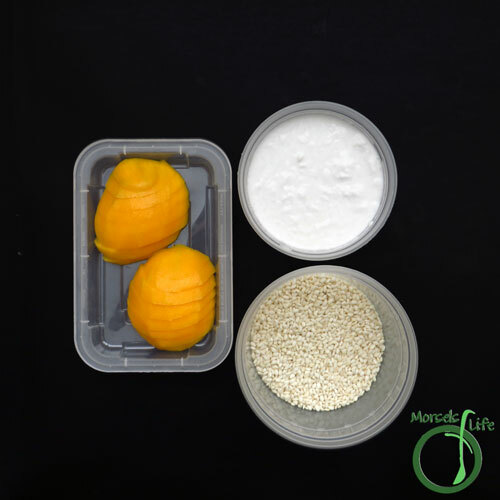 Once it is cooked, mix in the coconut milk, top with some mangoes, and you're good to go! What's your favorite Thai dessert? 2. Soak the rice overnight in water about an inch higher than the rice. An alternative if you’d like to make this rice on the same day is to just dip the rice in (preferably hot) water, although it will take a bit longer to cook. 3. Steam the rice. I used a bamboo steamer lined with cheesecloth, but any steaming method will work. The cheesecloth was simply to keep the grains from falling through the gaps and may or may not be needed depending on your hardware. The rice is cooked until it turns translucent and chewy. If you only dipped the rice in water, it will take a bit longer to cook, but if you soaked the rice overnight, it should take no more than 10 minutes or so. 4. Meanwhile, dissolve sugar in coconut milk over heat. 5. 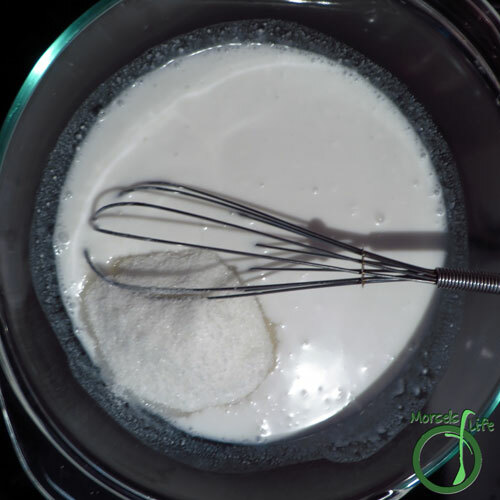 While the rice is still hot, mix the coconut milk into it. It is important to perform this step while the rice is still hot so that it has a chance to soak up the coconut milk and flavor. Yummy! I always try to leave room for mango sticky rice when I go to Thai restaurants! Thanks for sharing with us at the Merry Monday link party. I hope you'll join us again next week. Sharing your post on Twitter! I used to do the same! Then I started making it myself. Sometimes it can be a problem since you don't have to go to a restaurant to get it anymore then. :) Thanks for the shares! 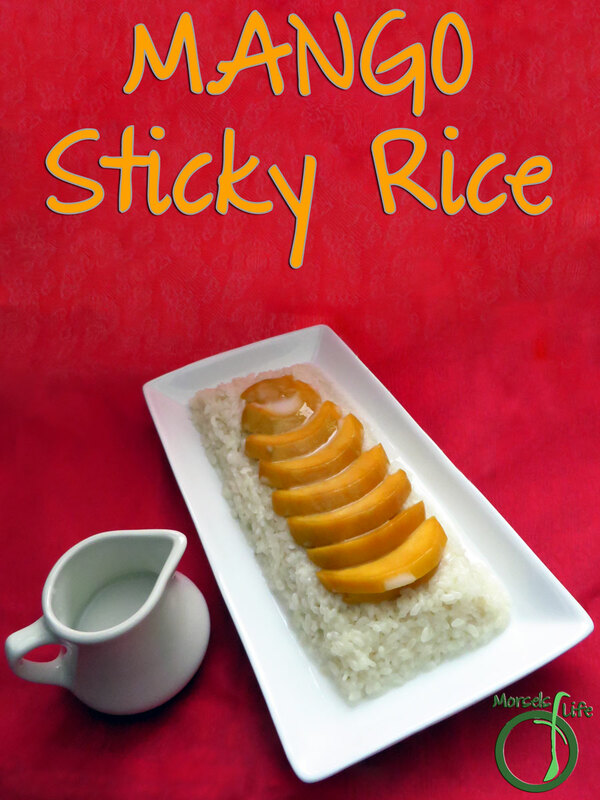 Sticky rice is a family favorite and I love this mango twist. It looks delicious! Thank you for sharing at the Recipe Swap. I'm going to make this for a friend soon. She's been talking about the Mango Sticky Rice she sampled last year while touring Vietnam, Laos and Cambodia. Thanks for the recipe.